Here's a complex structure I thought needed it's own page! 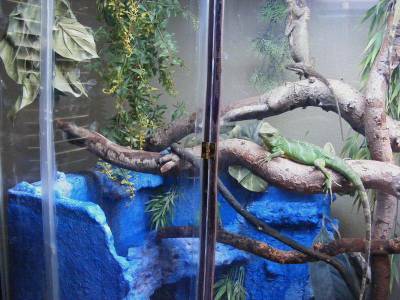 It was created for chinese water dragons, a mountain horned dragon and a sailfin dragon. This example shows how large and creative you can get with a variety of fake rock techniques. Hey Lizard Landscapes!!! So i wanted to thank you for the brilliant idea of fake rock creations and showing the process of building them. 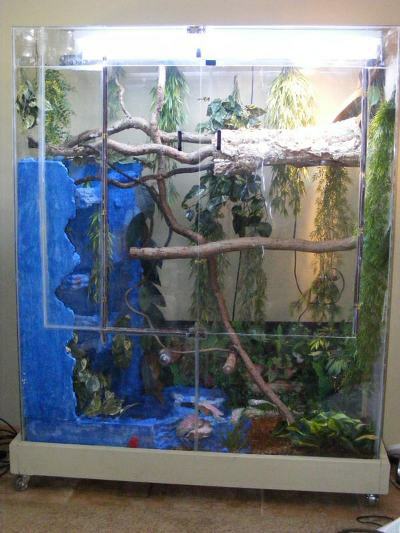 I have a custom cage that i built last year that is made for 2 chinese water dragons, 1 mountain horned dragon and a sailfin dragon which was not present in the pictures. 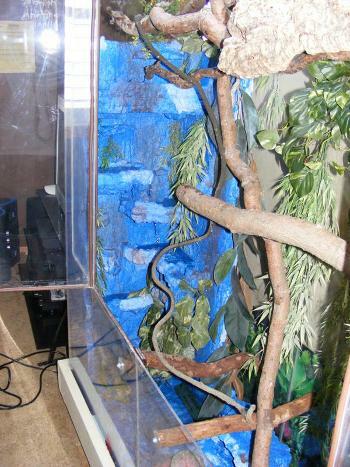 My cage is 5 ft 10 in long, 18 in deep and 6ft tall with alot of branches. This gave me a chance to shine and show how your technique can work in large applications for bigger cages and for rainforest animals. 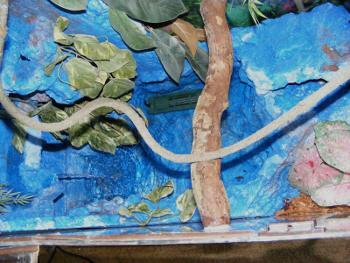 The first pick is from a distance of my cage with my waterfall and river bottom inside. The waterfall wall contains 4 waterfalls and a series of 2 rivers that progress down to the last waterfall. The river bottom is 6 inches deep with steps in and out, a hide that you can see in the last picture and a plant holder for my one fake ground plant (2 real ones on the ground- helps with humidity and looks great). Together the wall and river bottom stand about 4 ft 6 in from bottom. 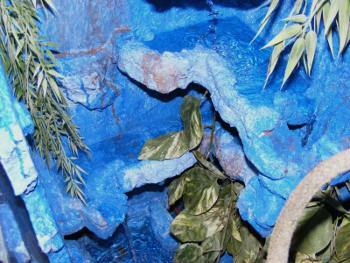 The idea was for it to look very rainforest and slate (natural material) like. Slate contains different blues and rust (the discoloring brownish areas). 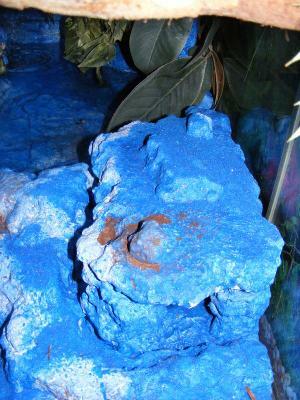 I also used a blue sand to give color and texture to the creation. The water pump, lines and pour hole (water exit into top waterfall) are all well hidden with a control valve as well in order to control the flow. (Hint: a high powered fountain pump is the only thing that can effectivly pump the water up this high. 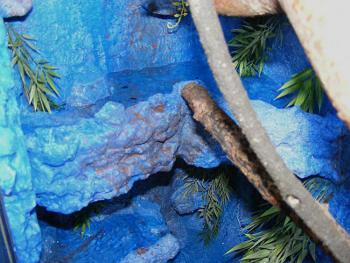 Previously the pump pushed the water up 5 in a half feet up to the original waterfall i built into the cage. Also, use the control valve so you can adjust the flow as the pump maybe to high flowing for your creation). 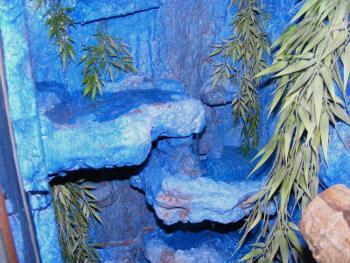 I read that you are worried of the idea to cover a wall with a fake rock creation and have come up with a way to safely place these mammoth peices without breaking them or the cage. Its all in the support structure. I used 1x2 birch for support on the back and left walls of the waterfall creation to create some rigidity. Then i bolted through the braces in 4 spots to the cage. Then silicone it to the cage as well for extra hold and to keep things from falling behind. Your definitely right about time as this took me 3 weeks of progressive work and alot of frustration as some areas may be really hard to get to. So take your time and make it perfect. Some hints i picked up on are to use the same colored sand in areas you silicone after your done so it looks natural. Also i have figured out that the silicone can blister up and allow water underneath. If this happens or you do not want to take any chances i would suggest going to home depot and buying a smaller container of red gaurd. First remove the silicone from the submerged areas if already applied. Red Gaurd is a waterproof membrane that can be used in the building of showers to create a thick floor pan. Its pink when wet but drys a dark red and sticky when wet too so you can take different sands and create a colorful rock area with reds and so on. The bottom and lower sides of mine are red and blue sanded so it looks very natural. The product is also very strong and will last forever without leaking so i really recommend using it. So i hope you enjoy seeing how and where your videos are going with people and different creative minds. Thanks so much for the ideas!